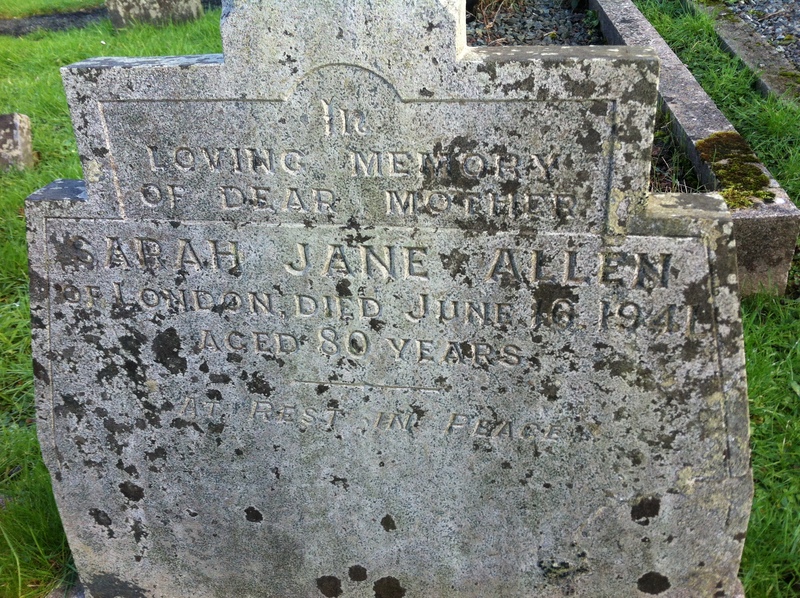 The first name on the memorial in Nevern’s Churchyard is that of Sarah Allen who died in 1941, at Llwyngwair. Sarah Jane Lawson was born to James Lawson and Mary Ellerton on 27th October 1860 in Bethnal Green, East London. 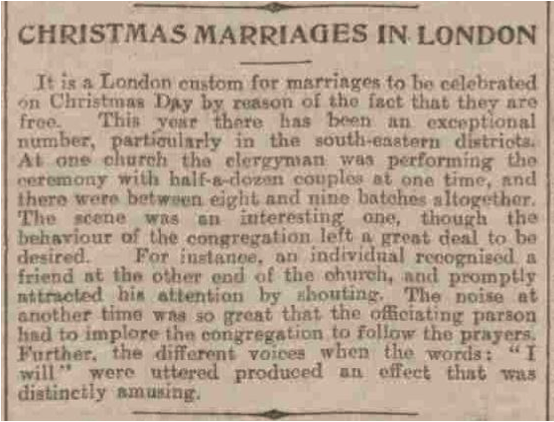 At the age of 20 she married John Edward Thomas Allen, on Christmas Day at St Mark’s Church, Walworth. The Christmas Day wedding was not unusual at the time; it was a day when no one would lose wages by attending and when the bride and groom would benefit from the traditional offer of free wedding services at Christmas and Easter. By December 1900 the custom was well entrenched and the clergy were evidently finding it difficult to manage the crowds. 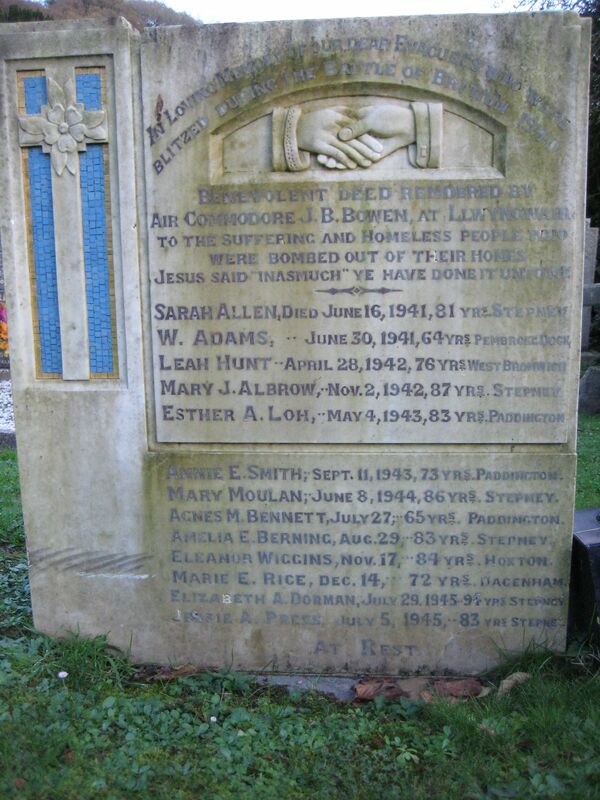 Sarah and John had ten children but five died between 1891 and 1903, two at birth. John died in 1914. 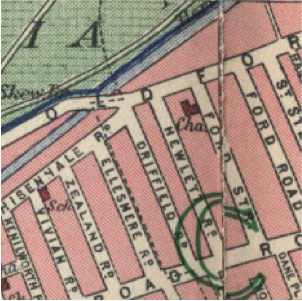 After her husband’s death Sarah lived at various addresses in the Bethnal Green area of London with members of her husband’s family. However, the docks, canals and railways that intersected the East End made it a target for German bombs. Although 77, Hewlett Road, where Sarah was living at the time, does not appear to have been directly hit during the first eight months of intensive bombing, high explosive bombs fell on Driffield Road and Old Ford Road. These were close enough to cause damage at Sarah’s address and Hewlett Road now comes to a stop at number 43. The section of road where Sarah’s home had been forms part of a post war housing estate. Her evacuation from London would have been arranged by the Salvation Army whose centre in Shadwell seems to have coordinated the rescue but as that also was bombed there is no documentary evidence in The Salvation Army Archive. Sarah died in June 1941, within a year of her arrival at Llwyngwair. She was survived by three of her children, Albert, Florence and Blanche. Her son registered her death and the family arranged for an individual head stone and burial plot that can be seen behind the main Llwyngwair memorial. IN LOVING MEMORY OF DEAR MOTHER, SARAH JANE ALLEN OF LONDON DIED JUNE 16TH 1941 AGED 80 YEARS. AT REST, IN PEACE. I’d like to thank Jackie Lawson, Sarah Allen’s great grand niece, for contributing the photo and family information that have helped us tell her story. This entry was posted in History, Religion and tagged evacuees, Llwyngwair, Nevern, Sarah Allen, Second World War, St Brynach's Church. Bookmark the permalink.